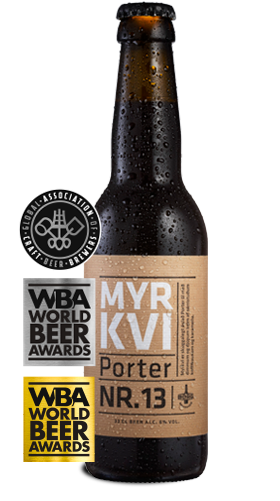 Myrkvi is an unfiltered full-bodied Porter Ale with a dark twist. It is seasoned with coffee from Huila in the southwest of Colombia, specially roasted by Reykjavík Roasters. The coffee gives this ale its depth in cooperation with a variety of roasted malts. Myrkvi is an Icelandic given name, meaning the dark one.